Spurgeon urged his pastor’s college students to “throw away the servility of imitation and rise to the manliness of originality.” 1 He never wearied of telling them to be themselves and warned them against any imitation or pretense. Preachers should neither be copycats nor men-pleasers. Be your own man. Be an independent thinker. Be yourself. Don’t be a slave. Was Spurgeon consistent, though? You have probably heard or read another of Spurgeon’s well-known quotes: “The man who never reads will never be read; he who never quotes will never be quoted.” 2 The first quote is from a lecture to his students and the second is from a sermon he preached from his pulpit in London. In the one, he said to be original and not an imitator. In the other, he said to read and quote other men. 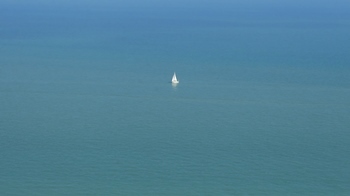 The two statements are least in tension, if not in conflict. How do you be original and quote others? How can you be an independent thinker and read the thoughts of others? The statements can be resolved, and resolving them answers the pertinent questions for us: How do you be yourself, an independent thinker, truly your own man? Part of the problem lies in misconceptions of what being your own man is. Misguided attempts at being one’s own man range from comical to sad. Let’s explore the wrong road for a moment. Examples of getting this wrong are crowding in my mind like shoppers at the doors at Walmart waiting for Black Friday to begin. However, I am going to restrict admittance so as to keep this manageable. One way to get this wrong is like the angsty middle school girl. She wants to be her “self” so she goes goth, dyes her hair pink, or otherwise adorns herself in outrageous fashion. She seeks society among outcasts, isolating herself and always bewailing the fact her lot in life is all because she doesn’t “fit the mold.” She never considers that her ostracism is mostly self-imposed, or due to the fact she’s not nice or not a very good friend. Maybe she never considered that her attitude stinks worse than the fourth-hand military jacket she got from Goodwill. If we look across the landscape of American Christianity, we see that preachers trying to be themselves doesn’t look a lot different. Some wear jeans and t-shirts, have their hair a little longer, and eschew churchy talk for grittier street words. Whatever difficulty they face, they quickly blame it on other people oppressing them for being “different.” They don’t “fit the mold” either, and they repeatedly tell everyone about it. They don’t seem to consider their conflicts with people might have more to do with their own attitude and pretensions than it does other people’s backward ways. 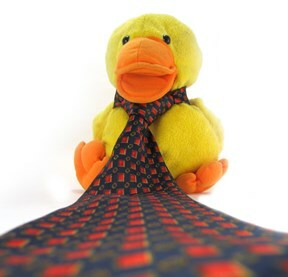 In fact, other people don’t seem to be as hung up on their clothes as such preachers are. I could get up in the morning and put on cowboy boots and a cowboy hat, but that doesn’t make me a cowboy any more than faded jeans makes you your own man, or any more than putting a tie on a duck makes the bird a preacher. Being your own man is not that way. You cannot be an independent thinker by simply changing your shirt. It’s not about crafting an image or affecting a persona through something we can put off or on. Aside from that, Proverbs identifies the man as a fool who will not receive counsel and instruction from others (Proverbs 1:7; 10:8; 12:15; 15:5). Thinking that being your own man means having no regard for the thoughts of others is thinking you are the wisest person in the world. It is thinking there is no other human being that can teach you anything. To be an independent thinker, you have to first be a thinker. Spurgeon said that kind of thinking proves you have no brains of your own. If you think about the two different pieces of advice, the answer is there. On one hand, Spurgeon said to read others and use the thoughts of others. On the other hand, he said to be original, not a slave, and not an imitator. How do you do both of those things? You do it by reading or listening thoughtfully for understanding. Someone who reads or listens to someone and then simply reproduces them verbatim, hasn’t learned nor understood anything. Your own thoughts haven’t been sharpened or informed. You could be a lazy plagiarist or a thoughtless plagiarist, but you would still be only a plagiarist. With practice, you could recite Shakespeare, but that doesn’t mean you understand it. Reading thoughtfully for understanding means a sort of reverse engineering of what you read or hear. You must follow the argument, or the train of thought, to see how the conclusion was arrived at. If you hear a good sermon, don’t just get up and preach it. Examine it. Reverse engineer it so you understand why it was good. If a preacher makes a great argument in the pulpit or in print, work to understand why it is a good argument. If you hear an apologist give a good refutation of error, work through it to understand why it was good and why it was effective. Just because something sounded great or affected you, don’t turn around and use it on others. You have to study it. You have to make sure it is true and the logic of it sound. This is reading or listening on another level. You are not only hearing what someone thinks; you are also understanding how they think. 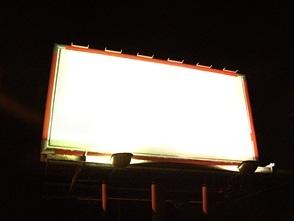 You will detect blindspots and prejudices. Doing so sharpens your own skills and thinking. Working at this will improve your own thinking and make you a more independent thinker. It will grow your discernment to where you’re not as easily wowed by a charismatic or persuasive speaker. Being able to get to the bottom of things is critical for independent thinking. This post is not about properly attributing your sources. That is a good discussion but not the topic at hand. You could come across a well-put statement and recite it with proper credit, but still not understand it. What does the quote mean? Why did the author say that? How did he come to that conclusion? Pastors must refute error (2 Timothy 2:24-26; Titus 1:11, 13). Refuting error requires having a reasonable understanding of the error. You must get to the bottom of things with error in order to understand how and why it is error, and to fully refute it. Are your people to avoid error simply because you told them so? Will you convince and instruct anyone by simply saying, “Trust me, that’s wrong.” Though some may trust you in the situation, without showing them how and why the error is wrong, you have not helped them mature. It takes more than “I say so” to keep yourself and your people from being tossed about by every wind of teaching (Ephesians 4:14). Pastors must be independent thinkers so they can model independent thought and equip their people to think independently. It’s not jeans and t-shirts that guide and guard people away from error. And, if you leave this post thinking I’m talking about what preachers wear, you haven’t got to the bottom of it. I sat in the small, mostly white room. You could say it had a mauve accent. It was cold, though I wasn’t chilled. But, it was cold enough that everything felt almost damp. The cleanliness of the room was not in question, but I still wanted to touch as little as possible in there. Directly across from the straight, vinyl covered chair was a wall poster of a blackened lung that belonged to a longtime smoker. It reminded me of warnings against smoking from junior high. Prime of life sounds nicer than middle-aged, but it doesn’t soften the realities that come with it. We could also say I’m at the top of the hill looking down the other side. I appreciate the attempts at positive spin, but I’m not bothered by it. Middle age frightens me, but not because of reduced energy levels, increased blood pressure, gray overtaking what’s left of hair, or more time spent in that little room with the doctor. Middle age is dangerous, particularly for a preacher, because being over the hill means it’s effortless to coast down the other side. The allure of easy chairs, TV sports, warm beds, and food and drink becomes stronger, or maybe the man is weaker. Young preachers all know older preachers they do not want to be like. They’ve seen the preacher who might as well advertise, “Have sermons, will travel.” He has his kit of sermons he’s preached hundreds of times and has warmed over so many times he could deliver them comatose. Young preachers see the cranky, bitter, ill-spirited old preacher who can instantly rain on any parade. They’ve seen the greasy salesman preacher always buttering everybody up and, as C. S. Lewis once said, if the biblical text had smallpox, his sermons would be in no danger of catching it. They’ve seen the politicking old preacher who is always calculating and being in the right place at the right time with the right people. They’ve seen the weeping preacher who’s not like Jeremiah, but rather is weepily pouting in the corner and continually licking his thirty year old wounds. They’ve seen the Elijah-under-the-juniper-tree preacher. He’s convinced he’s the only one faithful left and all these whippersnappers ain’t much. Young preachers see these older specimens and don’t want to be like that guy. I doubt most of those older preachers started out that way. They probably weren’t so different from the young preachers today. I venture to guess that decisive turn came in middle age for them. That’s the time when it’s easy to think you’ve laid up enough goods that you can relax and live off the store. That’s the time when it’s deceptively easy to stop making progress in the ministry. In the interest of Fair Use, I disclose I’m about to paraphrase and fool about with something John Stott said somebody else said in his book on preaching, Between Two Worlds. When men stop making progress in the ministry, stop reading and thinking, it begins to show around the age of 45, or middle age. Their coasting typically deposits them on one side or the other. They become a bigot or a sentimentalist. The bigot resorts to the points of his dogma and hammers those nails until the heads are shiny at first, but soon they’re worn clean off. The sentimentalist is a widower who can’t let his deceased wife named Tradition rest in peace. He’s always digging her back up and bemoaning how they don’t make ’em like they used to. Whatever you or I think about Stott’s thoughts about somebody else’s thoughts, there’s something there. A call to ministry is a call to serious, strenuous work marked by progress (1 Timothy 4:15). Paul told Timothy to give himself “wholly” to this work and continue to do so (1 Timothy 4:16). Paul explains what it takes to be “a good minister of Jesus Christ.” Spoiler alert: it takes a whole lot of continued, really hard work (1 Timothy 4:6-16). Just like the guy riding the pine wants to the be the star of the game but doesn’t want to practice, everyone wants to preach well when in the pulpit, but not everyone wants to work hard every day in the study. Middle age comes and brings a lot of dangers, but it should not be the top of the hill for the preacher. 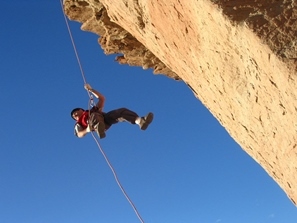 He should continue to climb and make progress until death comes, or he is no longer physically able to climb. Young preachers will face this Hill of Difficulty at some point. It will be tempting to coast. Remember the warnings and persevere, brothers, persevere. John Bunyan’s Pilgrim’s Progress is one of the most famous English novels. It is a literary classic. The book has a quest plot structure. Christian is trying to get from the City of Destruction to the Celestial City. It has many tropes of the quest, such as obstacles, dangers, temptations, setbacks, false helpers, and true helpers. The quest is a common plot structure throughout literary history going back to The Epic of Gilgamesh and Homer’s The Odyssey. The quest begins with some lack in the protagonist or some need the protagonist has to meet. If it’s a journey quest, there is a destination the protagonist has to reach. If it’s a personal quest, there is something that has to be learned or some skill that has to be acquired and mastered. The common thread is that the protagonist has to do something he doesn’t know how to do. The story unfolds as the protagonist encounters obstacles he has to overcome to reach the end goal. Quests are popular and resonate with people because we all have things we need to accomplish, but don’t know how to go about it. The protagonist needs help and finds it in the stories in various forms, often just enough help at the right time to get them over the present obstacle. Helpers come in various forms in quest stories. Sometimes it is a single helper in the form of some wizened, curmudgeonly man who is a little grouchy and talks in riddles. There can also be various helpers along the way, and danger in the form of false helpers who misguide the protagonist. Christian in Pilgrim’s Progress has helpers in the form of The Evangelist, The Interpreter, the Shining Ones, the palace damsels, etc. Helpers are one of the reasons quests resonate with people so well. We feel the need for helpers, people with the knowledge to propel us forward at just the right time. We often seek helpers in our life, but we also can end up frustrated and disappointed with what we find. Young preachers are fresh-faced protagonists in their own quest. The young preacher has a job to do. He needs to preach the Bible to feed people and to equip them to do the work they need to do (Acts 20:28; 1 Peter 5:2; Ephesians 4:11-16). In a sense, the young preacher is on a quest to become a helper for other people on their quests, like the shepherds of the Delectable Mountains, Knowledge, Experience, Watchful, and Sincere. The young preacher’s quest is not to preach great sermons—open with a joke to get their attention, alliterate three points to make it memorable, and close with a poem to affect their emotions. No, the young preacher’s quest is to become a shepherd to people and to care for their souls by feeding them the Word of God. Though I’ve never looked the part, I was a young preacher once. I can remember the treading water feeling while I tried to figure out what I was doing and should be doing. I was always looking for help. I found help here and there along the way and I’m thankful for all I have had. I still look for help, but I suppose I’m a little better at finding it today and a little quicker in sorting good from bad. I’ve had different conversations with other pastors about the struggles we faced as young preachers and the help we did have and the help we wanted to have. I’ve seen pastors have a heart to help and encourage young preachers. 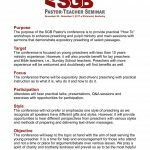 We’ve talked about how to do it, and finally somebody said, “Let’s do it.” A few different pastors working together and brainstorming came up with the idea for the Sovereign Grace Baptist Pastor-Teacher Seminar. The seminar will be November 30 to December 2, 2017 in Richmond, KY at the Best Western Hotel conference room. A Facebook page has been set up for information and updates about the seminar. Let me tell you a little bit about it and see if it will be helpful and encouraging to you. We do have a purpose statement for the seminar you can view by clicking the image below. The seminar will focus on the preaching ministry. We know there are a host of topics that would be of interest, but we also realize we can’t cover everything. We decided to focus on the particulars of preaching regularly to a congregation. We also know there are many preachers who have something to contribute to help young preachers, but we can’t have everybody in the limited time and space we are working with. What we do have are preachers with a heart to help and encourage young preachers and an understanding that that’s the primary aim of the seminar. If you are a preacher with fewer than ten years in ministry, a pastor in your first pastorate, a preacher not yet pastoring, a man wrestling with a call to preach, or even a Bible teacher in your church, then this seminar could be some help to you. We have put a schedule together you can view by clicking the image below. The schedule might change some, but it will be very similar to this. We have five different speakers who will present seminars on the various topics listed during the morning and afternoon sessions. These seminars will be practical and interactive. It will be more of an informal classroom feel than a formal lecture feel. There will be handouts and free books and such for those who register. You can register by filling in the online form here. There is no cost to register and attend. 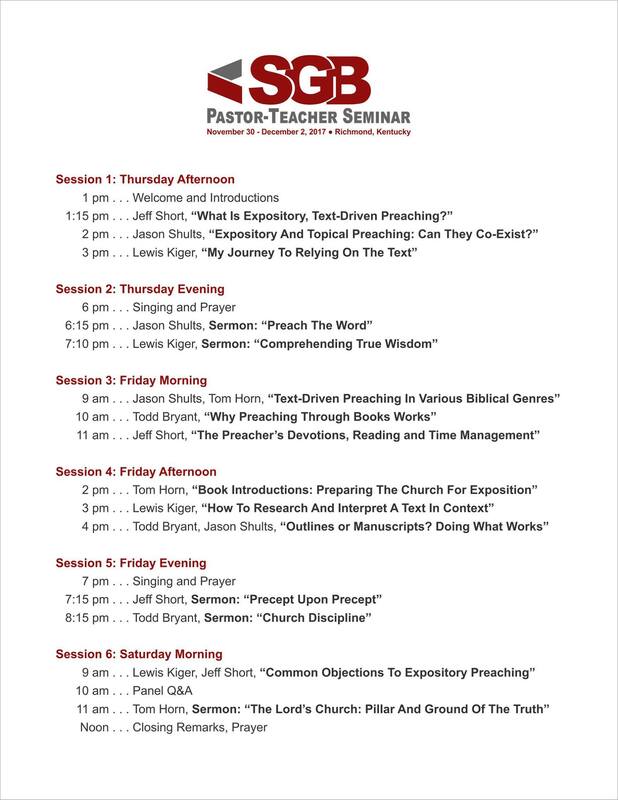 The evening sessions will have sermons. 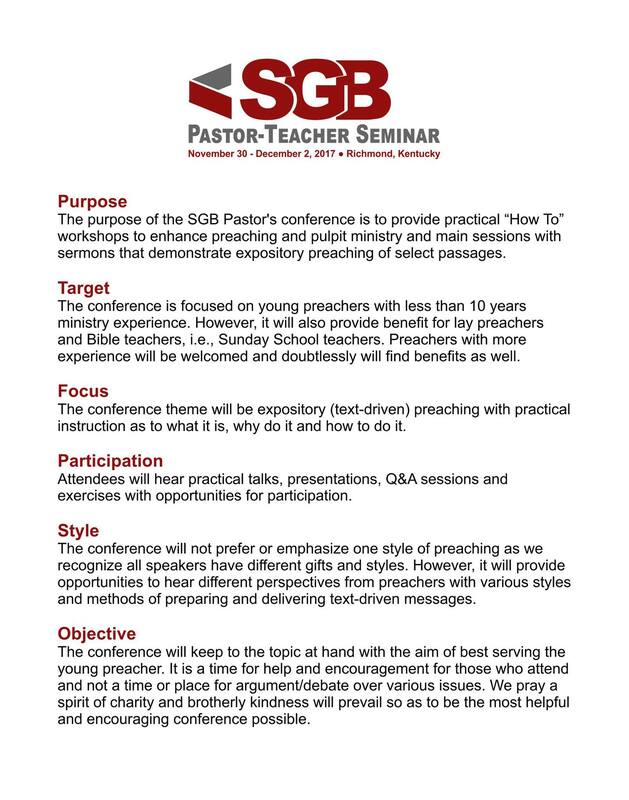 So you will have seminars by five different speakers that pertain to the preparation and delivery of sermons and you will also have one sermon from each speaker to hear an example of how they bring it all together. The goal is to present you with different perspectives from preachers who have different gifts and methods of preparing and preaching sermons. We are not trying to promote “one way” of preaching, other than being faithful to the text of Scripture in all preaching. The different methods and styles will give you the opportunity for consideration and hopefully take away what is helpful to you. We will also have a Q&A session on Saturday to answer questions submitted ahead of time by those attending. 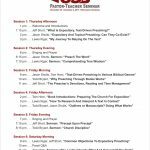 The questions can be anything related to preaching or pastoral ministry. We will give preference to questions that are most relevant to the seminar theme and the most likely to be helpful to a greater number of people. Be watching for more information about submitting questions. The seminar will be held from Thursday, November 30 to Saturday, December 2, 2017 at the Best Western conference room in Richmond, KY. 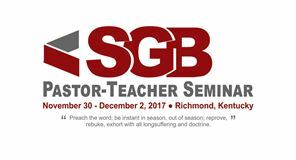 The hotel has given us a group rate for rooms at $75 per night, if you mention you are with the SGB Pastor-Teacher Seminar when you call to book your room. Obviously, doubling up on rooms and splitting the cost is a good idea. The hotel will provide a full breakfast to those staying there. You will need to be prepared to cover your own meals otherwise. You do not have to stay at the hotel to attend the seminar. You can watch the Facebook page for updates and information. Feel free to ask any questions you may have about the seminar. After preaching a while, you will be called to your first church. You will not be ready. Depending on the quality of mentoring, some of you are more not ready than others. Before being called, the church, or someone from the church, will ask you questions and those questions can be anything. It’s hard for me to help prepare you for that other than to say be ready for anything. If the church went through a bad experience with their previous pastor, you will probably be asked a number of odd questions that are mostly designed to make sure you are not like him. If the church’s previous pastor was unhealthily venerated, the church will ask you many questions mostly designed to ensure you are just like him. Be ready for anything is the best I can do from this side of the process. You cannot control what a church says or does in communicating with a prospective pastor. But, you can control what you do in the process and you should remember you are interviewing the church just as much as they are interviewing you. I am not promising the definitive list. I’m sure others with more wisdom and experience can add to this list. My goal is only to list several things you should consider about a church before you accept the call. And we’re off. You will want to ask for a copy of their church documents, i.e., articles of faith, constitution and bylaws, covenant, etc. You need to learn about their doctrine and practice. If the church doesn’t have these documents, or if they’re vague or very brief, you will need to ask questions to find out the sort of things that would be in such documents, if they had them. You need to know every position the church has and who holds those positions. You need to know if those are paid positions and what the responsibilities of those persons are. In this area, you need to know things like the handling of finances, cleaning and property maintenance, etc. You need to know how many members the church has. You need to know how faithful those members are to the services and such. You need to know if the church maintains members who are not in the area. You need to know the church’s position on attendance and how problems in this area are addressed. You need to know if the church has any special needs members, such as elderly, shut-in, nursing home, etc. You need to know what a typical year in the life of the church looks like. What events does the church have? What special services? You need to know what missionaries/ministries the church supports financially. You need to know what outreach the church does locally. You need to know what the church expects of a pastor. Their expectations may be biblical or not, but you need to know what those are. This would include anything and everything they expect a pastor will do. You need to know the salary they’re offering, how it will be paid, etc. If they have a parsonage, you will also need to know their expectations regarding it. You need to know if there are any current problems within the church membership or between them and other churches. You need to know what you’re stepping into as much as possible. You need to know about the previous pastor and what happened with him. I am not suggesting nosiness, but you need to find out relevant things to pastoring this church. 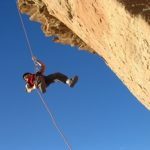 Again, that list is not the definitive list, but it is a list that touches on many areas and discussing these things will probably bring out what you most need to know. It’s better to eliminate surprises as much as possible. Some things that come up will need an immediate conversation, while others you just need to be aware of. Answers to these questions will affect the way you do things. I am not suggesting that any bump in the road here means you have to run away. Remember that things are not always what they seem and there are no perfect churches, or perfect pastors.